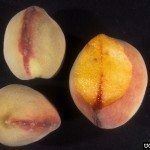 I grew it from seed and it has had small peaches in years past, although they had black specks and were not delicious. How can I restore tree to health? As of last spring it looked healthy. It has rained a lot lately. The rain is likely the cause. Too much water in the soil can start to suffocate the roots. If you can, try to improve the drainage. Otherwise, you will have to wait for the rain to back off a bit so that the soil improves.